You can follow them on Facebook, instagram, or twitter. “ReMoved is a short film following the emotional journey of a nine-year old girl who is taken from her abusive birth home and placed in the tumultuous foster care system. After winning multiple awards at several film festivals within the United States and internationally, this 13 minute film proceeded to spread virally online and garner praise across the board from foster alum, current foster youth, social workers, foster parents, court advocates, judges, attorneys, teachers, and others. 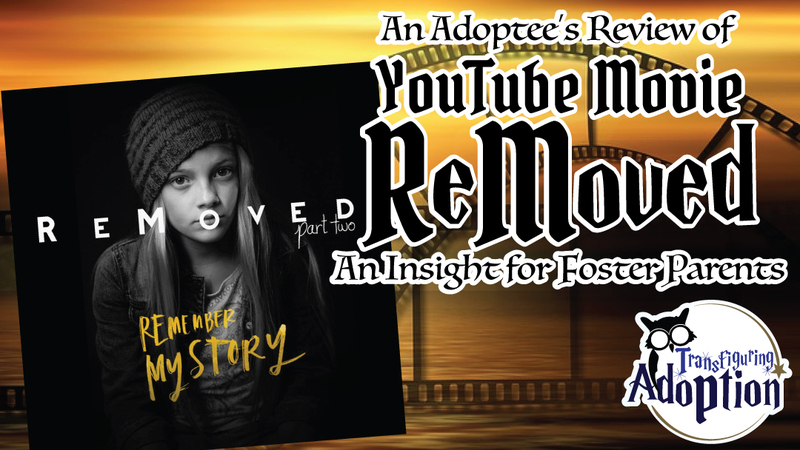 A while ago, I saw the first installment of “Removed” an internet film about Zoe, a foster child and her struggles. It is narrated from her point of view. In the first installment, we see Zoe with her biological mother, living in a home with fighting, anger, and pain. She takes care of her baby brother, and the housework while her mother and father drink, smoke, and argue. In one such argument, Zoe gets between her parents, and is hurt. The police come and arrest her father, and she and her baby brother are removed from her home. Zoe is hurt, confused, separated from the only family she ever knew and acts out. We see her being moved from foster home to foster home, and we see how unstable her life has become. This short, almost 13 minute movie will break your heart. I wish I could quote everything Zoe says during her narration here- but I don’t want to give it all away. I constantly found myself tearing and chocking up, and wished I could reach inside of my computer and hug her tight. I wished I could be the one to tell her that she is not alone, and that she deserves to be loved, fought for, cared for, encouraged, and accepted. I wished I could tell her it wasn’t her fault, and that she can have a bright future. The first installment ends with Zoe getting her wish of being with her brother in a steady foster home. I couldn’t WAIT for the second installment to come out, and I got my wish in June. Zoe has made peace with her situation, and is learning to put down roots and be happy. She is developing her artistic skills, and falling into a routine. She has a “family” and is growing up. Her mother’s parental rights have been terminated for her brother Beniah, and he is once again taken away and adopted. Zoe’s biological mother tells her she will fight for Beniah, but not really for her. Zoe once again finds herself in a tornado of emotion and unsure about her place in this world (like many adoptive and foster children). She has to choose for herself. She has to learn and face her demons. This movie duo is riveting, and it leaves your heart hurting for all of the children in Zoe’s situation. It makes you want to save them all, and I highly recommend you grab a box of tissues before you watch it.